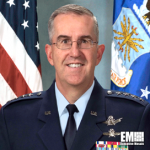 Air Force Gen. John Hyten, head of the U.S. Strategic Command, has listed three near-term goals that the Defense Department needs to achieve in space programs, Space News reported Tuesday. Hyten, a 2018 Wash100 inductee, told Space News in an interview that DoD needs to bring down launch costs to less than $100 million. He added that recent contract awards show a decrease in space launch rates, but they have yet to reach the desired cost level. The U.S. military also needs to shorten the development timelines for satellites to three to five years, Hyten stated. Hyten said the third goal is to build modular spacecraft that can accommodate the integration of new payloads.